Anybody tried messing on with this stuff? Bought of Amazon. It has looaads of really positive reviews. 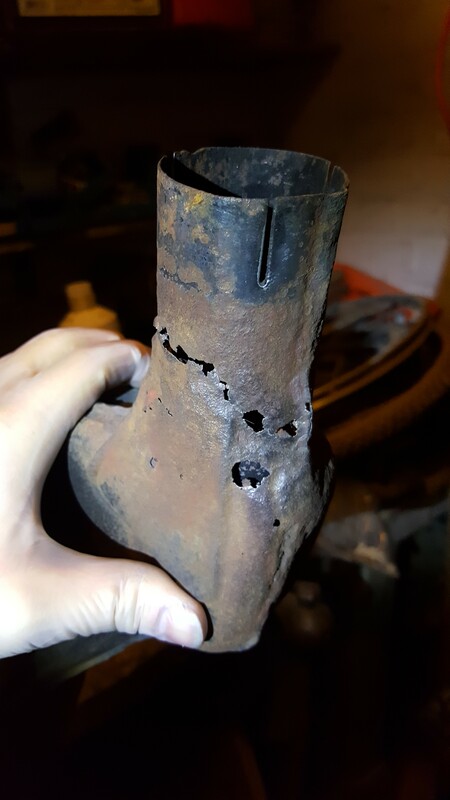 Won a cheap exhaust of eBay, (didn't really expect to win it ) that has a bit of rust / split at the end. The rest is in good condition... thought I might as well mess on with it see if I can make it serviceable. 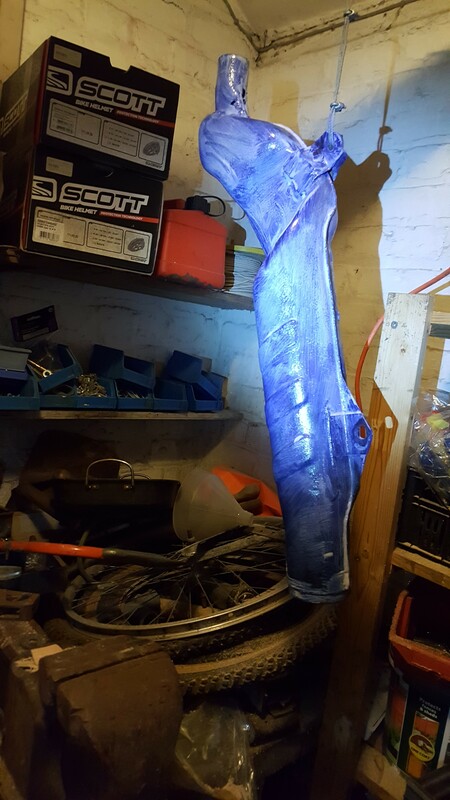 Here's some pictures..
Litterally only just applied the first coat so I'll have to post updates later as I go... it seems to be pretty neat stuff. Turns the rust into a complex organic iron oxide..thing? It's supposed to, once dry, create a thick black membrane that stops any further rust...alternatively - it may very well just be shite. It's just Kure rust by another name. Well yeah figured I may as well give it a bash. Needed the aqua-steel for the frame anyway. Wasn't 99p but it was cheap enough to allow me to call this an "interesting excercise"
Makes up for it that I got a pair of really good condition 500 panniers for next to nothing on auction. Mainly trying to find out what people think of this aqua-steel stuff.. 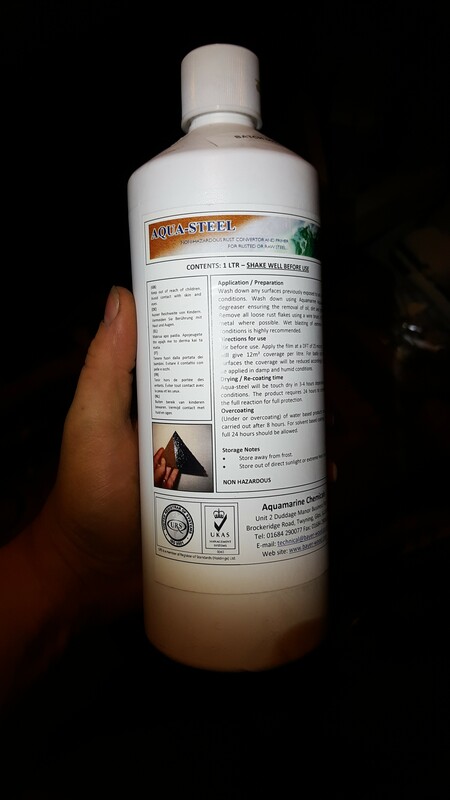 I think this type of product only works effectively when you have a small area of metal where the rust is just starting - it then prevents any further rusting from taking place. 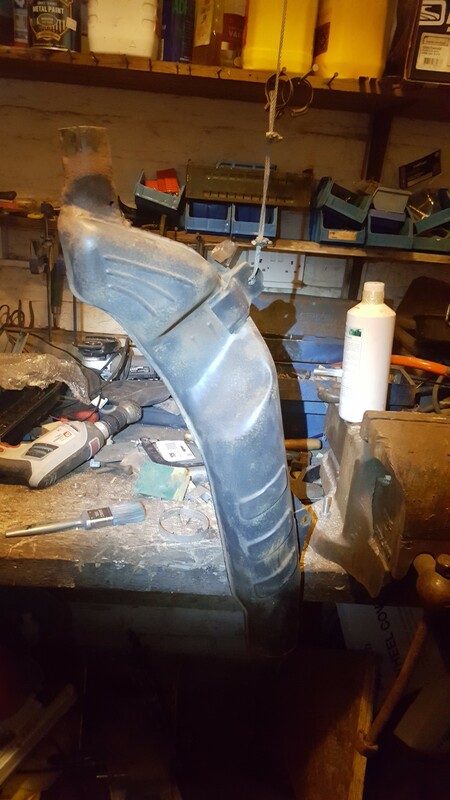 With this silencer, the majority of the rust needs to be removed first, either using a rotary wire brush or by blasting. If not, I think you simply convert the surface rust and the rusting then carries on underneath. Was that the item listed as Ok apart from a couple of holes ? I did see on the show that renovates Tanks of suspending an item in a water bath with I think it was salt?, they used an electric battery charger to plate a Bazooka which was well rusted and it came out quite serviceable after a coat of paint. The reason the Combat Warriors used electrolysis (with washing soda as electrolyte) to remove the rust from the panzerschreck was that they thought it was too fragile to shot blast. The electrolysis method is very gentle and only dissolves the rust and not the metal. In the case of an MT silencer, if the metal isn't strong enough to have it's rust removed with a rotary wire brush then the metal in question probably needs to be replaced with suitable welded on patches! Maybe best if you weld some plate over the holes in the silencer and it'll be good for a few miles more. As to the rust "remover" I can honestly say that the one called "Krust" does work. I have a trailer which the sides are made of box steel with wooden panels. The steel parts were painted white and after a few years the whole lot looked scabby with rust so I took a wire brush on a drill to sand the worst off and painted all the metal with the Krust stuff, I intended to re-paint the metal afterwards but due to life, the weather and other things the job never got done and a year later out in the weather the krusted parts are still black with no rust showing at all. CJ-MT wrote: Maybe best if you weld some plate over the holes in the silencer and it'll be good for a few miles more.